It was a beautiful morning in early August. 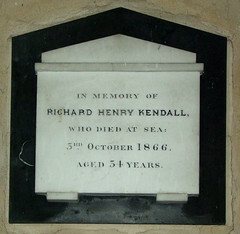 I had taken my bike on the train to Kings Lynn, and by half past ten I had already visited the churches in Castle Rising, Babingley, West Newton, Sandringham and Dersingham. And yet, as lovely as the morning was, there was still that heaviness which seems to sit over the whole King's Lynn area, a creeping malaise which perhaps drifts in from the marshland, settling over the town and the forests which spread around the Sandringham estate. It weighs you down - or, at least, it does me. And then I cycled up the steep hill out of Dersingham towards sunshine, into the hedged lanes through the rolling ridges and copses, and I knew I was free. It was the height of the barley harvest. Busy tractors hauled trailers piled high with the golden berries at impossible speeds through the lanes. It was best to stop, and let them pass. At the top of the ridge I could see for miles, and I could see a little village with a towerless church in the valley below, so I freewheeled down towards it. 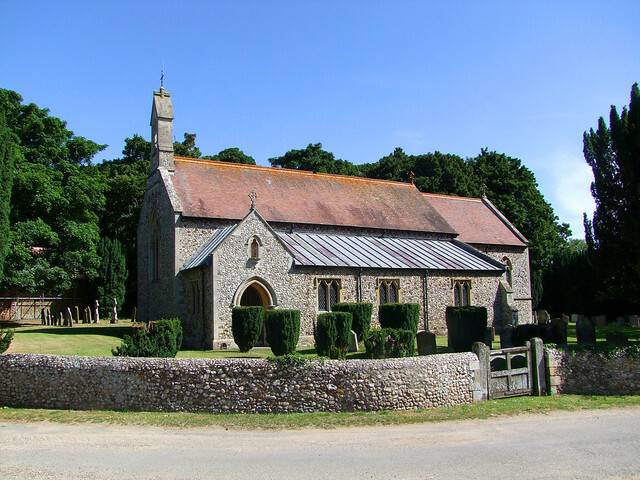 Ironically, church historians have a bit of a downer on Green because of his passion for neo-Norman, which he resisted here at Shernborne, but it is an enthusiasm which may have caused him to treat its most significant feature with the utmost respect. 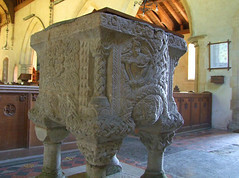 There are a group of about twenty Norman fonts in the north-west corner of Norfolk which are considered among the finest in the kingdom, and Shernborne font is the best of them. 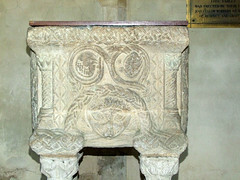 If somebody produced the Sherborne font today we'd think it was pretty amazing. That it was carved almost a thousand years ago, and has been here ever since, is staggering. 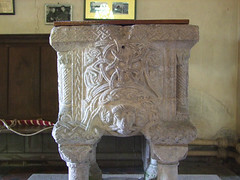 The key design feature is the use of plaited knotwork which trails around the font almost like foliage. All four sides are different. Faces peer out, figures in roundels strike mystifying attitudes. It is remarkable. 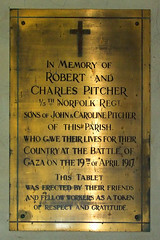 A heartbreaking brass plaque on the nave wall is to Robert and Charles Pitcher, two brothers killed in the First World War. 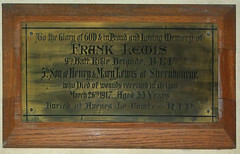 What makes it so sad is that they were both killed on the same day, 19th April 1917, in the Battle of Gaza. How does a parent ever get over something like that happening? There's no coloured glass in the nave windows, but even so you can't help thinking that this must be rather a gloomy place in winter. 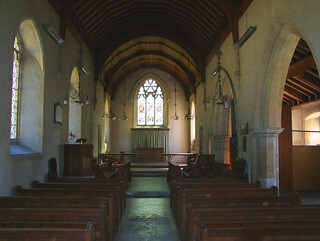 Not much light makes it through the low arcade from the south aisle. 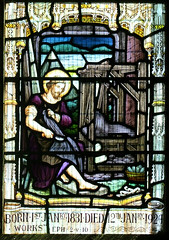 As if to brighten the place up a bit, an east window by Hardman & Co was installed in the 1920s, and it is rather good. 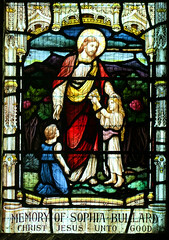 It depicts Christ as the Good Shepherd flanked by St Peter and St Paul, the patrons of the church. 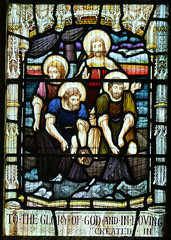 Below, we see Peter letting down his nets and Paul rather pleasingly as a tent-maker. 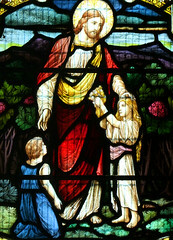 Christ asking that the children be suffered to come unto him completes the sequence. 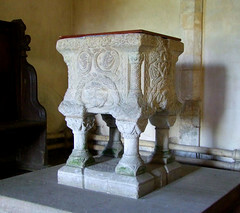 The font is not the only survival from the earlier church, for up in the chancel is a large 15th Century brass to Thomas Shernborne and his wife. It is mounted on the north wall, from which it will run away like so much butter if there is ever a fire here. 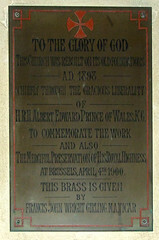 Brasses should really be mounted on floors, so the heat rises above them. 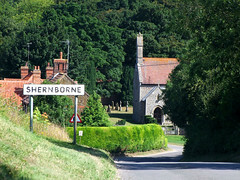 Thomas Shernborne was Chamberlain to Margaret of Anjou, an extraordinary thought in this tiny little backwater, tucked away from the rest of the world.